What had appeared a surefire march to promotion back into League One for Plymouth Argyle this season now isn’t quite as certain as first expected after a slight falter with the finishing line coming into sight. The Pilgrims had led the table at the turn of the year, and have occupied a top three position since a 2-1 victory over Barnet on September 29. However, despite a 2-0 win at Carlisle on January 2, 2016 hasn’t been the best year for Argyle so far, as they have been usurped at the summit by Northampton Town. Results haven’t been great either, as Plymouth have only won three of their last 11 games, including home defeats against champions elect Northampton and promotion hopeful Wycombe too. Derek Adams’ side are also on a run of just one win in their last six games, that a narrow 1-0 triumph over Notts County, losing two of their last three, picking up a single point in the process. From a position of dominance, they are now just three points above Bristol Rovers in fourth and could actually drop out of the top three for the first time in almost six months this weekend should they lose and Rovers pick up victory at Newport County. Defender Gary Sawyer is refusing to give up the title just yet though, despite trailing the leaders by 14 points with 10 games to go, as he told the club’s official website: “We won’t just let them take it, but obviously they’ve had a fantastic run lately and picked up so many points. The 26-year-old has come up against Luton already this season during his loan move to Stevenage. Plymouth have also signed goalkeeper Vincent Dorel following a short trial, while Chelsea midfielder Jordan Houghton will stay at Home Park until the end of the season. Team news: Scott Griffiths (knee), Ryan Hall (foot) and Jake Howells (knee) are all out for Hatters, with Nathan Doyle (knee) and Josh McQuoid (knee) expected to return to training next week. Alex Lawless could be included after recovering from the hamstring injury that saw him miss the 1-0 defeat to Crawley. For Plymouth, boss Derek Adams will check on Jordon Forster (jaw) and Carl McHugh (calf) before finalising his team. Striker Ryan Brunt is a long-term absentee with a cruciate ligament injury and right-back Kelvin Mellor sits out the game through suspension. Top scorers: Hatters: Jack Marriott, Cameron McGeehan (12). Pilgrims: Jake Jervis (12). Milestones: Defender Glen Rea is in line for his Luton debut after signing on loan from Championship club Brighton & Hove Albion. Man in the middle: Darren Bond - has taken 27 games this season, mainly Championship and League One matches, showing 82 yellows and two reds so far. Last year, he had 39 games, with 103 yellows and five reds, while this is his first Hatters game since the 2-0 win over Wrexham in the first leg of the Conference play-offs back in May 2012. Also had the 1-0 win over Kidderminster the month before that, as Robbie Willmott’s goal settled the fixture. Assistant referees are Richard Martin and Timothy Wood, with fourth official Mark Pottage. In charge: Derek Adams - 40-year-old who had a playing career, bar a brief spell at Burnley, north of the border, playing for Aberdeen, Ross County, Motherwell, Ayr United and Livingston. Became player-coach at Ross County in November 2006, taking on the position of player-manager the following year. Returned to Ross County in May 2011 as manager, guiding the side to the Scottish Premier Division, eventually leaving the club in August 2014 and after a spell out of the game, was named Plymouth boss in June, 2015. View from the opposition: Argyle manager Derek Adams - “We’ve got 10 games to go and we need to get going and really finish the season strongly. “If we do that then we’ll finish in a really good position and from our point of view we’re in a very good position. One to watch: Jake Jervis - started the season in explosive form, scoring seven in his opening 11 games before something of a drought, going seven without a goal, until three in two took him to double figures by November 14. Struggled since though, with just two goals in 18 appearances, but did end his quest for a first strike of 2016 in the 2-1 defeat at Accrington last week, making it 12 for the term. Despite being only 24, has had plenty of clubs since coming through at Birmingham, with spells at Swindon, Hereford, Preston, Carlisle and Portsmouth to name a few, before signing for Plymouth in the summer from Ross County. 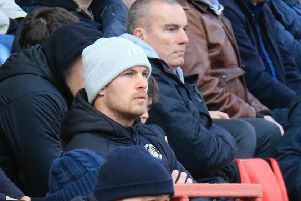 Friendly faces: Argyle striker Ryan Brunt played six times for Luton during the 2011-12 season after joining on loan from Premier League side Stoke City. Moved to Home Park in January 2015 and had scored 10 times in 39 games this season, until injury ended his campaign earlier this month. Hatters first team coach Kevin Nugent was signed by Plymouth for £200,000 in March 1992, playing over 150 times for the club, scoring 37 goals. Midfielder Olly Lee had two loan spells at Plymouth last season, making his debut against Luton and played 15 games, scoring twice. Meanwhile, Scott Griffiths spent a month with Argyle in the 2012-13 season, making six appearances until he moved to Kenilworth Road. Played for both: Paul Connolly - full back who came through the ranks at Plymouth, making over 150 appearances in his eight years at Home Park. Had spells at the likes of Derby, Sheffield United, Leeds and Preston, before moving to Luton in July 2014, although it was an unhappy time as he played just six times before leaving and since joined National League North side Stockport. We’ve got form: Hatters have not enjoyed a great deal of success at to Home Park, winning just eight of their 47 meetings, with 10 draws and 29 defeats, scoring 50 goals and conceding 93. It took them 34 years and 21 efforts to enjoy a first win, after failing to triumph in their Southern League meetings, that a 4-2 triumph in 1937 with goals from Frederick Roberts (2), Joe Payne and Edward Vinall, however, they have now tasted success on two of their last three trips. Last time out: Luton were 1-0 winners at Home Park last season, as midfielder Andy Drury scored the only goal of the game with a low finish into the bottom corner on 22 minutes. Hatters: Mark Tyler, Michael Harriman, Scott Griffiths, Steve McNulty, Luke Wilkinson, Shaun Whalley, Andy Drury, Jonathan Smith, Nathan Doyle, Jake Howells, Jayden Stockley. Subs not used: Elliot Justham, Alex Lacey, Paul Connolly, Matt Robinson, Alex Wall, Mark Cullen, Charlie Walker.